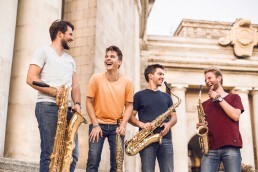 The Whoop Group is a young, energetic and ambitious ensemble consisting of some of the most talented Polish saxophone players of the young generation, united not only by their love for the instrument, but also by their deep friendship. Each and every single one of them has previously won prestigious solo and chamber music competitions in Poland and abroad, they’re also recipients of the Ministry of Culture and National Heritage Scholarship and the Young Poland Scholarship. It is, in many ways, truly an extraordinary group. The four of them are equally crazy and ambitious, afraid of no challenges and constantly trying new things during live performances. They specialize in performing classical and contemporary music, oftentimes arranged by themselves, but they’re also no strangers to other genres, i.e. popular music, movie music, jazz or even hip-hop. 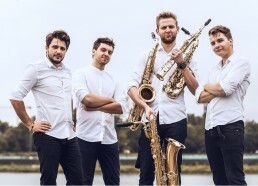 They began playing together in September 2016 as part of a Radio Poland “Five o’Clock” broadcast and they’ve been routinely performing ever since, enjoying public recognition and a growing worldwide fanbase. In 2017 they took part in three chamber music competitions and won all of them, receiving the First Prize in the Wind Chamber Music Competition in Warsaw, the Main Prize in the F.N.A.P.E.C Musiques d’Ensemble in Paris, and the First Prize in the International Chamber Music Competition in Bydgoszcz. As an important aspect of their work, the ensemble actively cooperates with composers from all around the world (USA, Mexico, Spain, UK, Hungary and Poland, among others) and often performs their pieces.